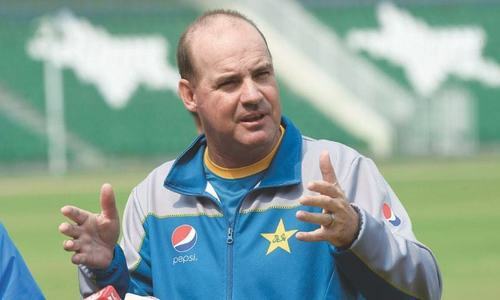 The Pakistan Cricket Board (PCB) on Friday strongly refuted reports of an angry outburst by head coach Mickey Arthur at the end of day two of the first Test against South Africa in Centurion. 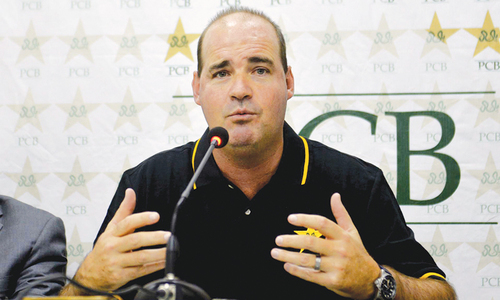 "The Pakistan team management led by Manager Talat Ali strongly refutes the baseless allegations levelled against Head Coach Mickey Arthur on his supposed 'angry behaviour,'" a press release issued by the board said. Earlier in the day, a section of the media while quoting unnamed sources had reported that Arthur not only yelled at captain Sarfraz Ahmed and senior players but also threw things against walls to vent his frustration over the dismal performance of the national team. "As per the norm, Mickey held a debriefing meeting at the end of the day's play which was held in a cordial atmosphere with inputs from team members and management, as is the usual practice," the PCB insisted. "Any speculation about [the] coach's angry behaviour towards the players is grossly exaggerated," it said, adding that Arthur, the team management, captain and all team members were "totally united" in their objective of producing positive results. According to the PCB statement, the team management hoped that the media would "refrain from speculating on the matter". Mere yelling and talk won’t help. Poor selection and nepotism is evident. I just wonder why reaction to failure for likes of Shan Masood, Imam and Sarfraz is different to likes of Ahmad Shehzad and Umer Akmal? Shahazad still still has better average than most of openers you have tried and Umar Akmal if not test format but in limited overs has better average and strike rate than most of your middle order. Well, he has no reasons to get angry ! Stop blaming Arthur!!! In fact it would be a good thing if he screamed at those three players, they have become a total liability for Pakistan. Further, since inzamam has been chief selector in 2016, Pakistan's test fortunes have have been awful, he should be removed as well. Shafiq and Sarfraz especially should be dropped immediately. My solution for this is bring in Fawad Alam as a middle order batsman and Captain, he would do a fantastic job! 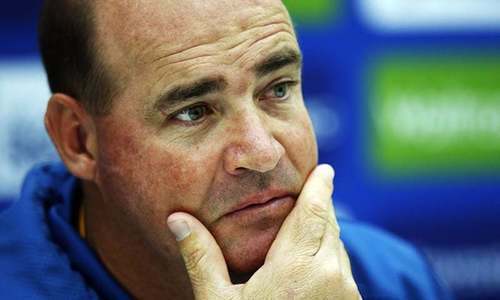 Mickey Arthur has a right to be Angry of Pakistani batting. He as coach is perfectly within his rights to tell his players to pull their socks up. What is the issue here? If I was there, I would be yelling at them too. This is absolutely miserable. Pakistan might as well send in their number 11 & 10 to start the batting each time. It won't make any difference to the final scoreline. No situation awareness Haris sohail omitted yasir shah in when Haris sohail could have filled the void of a Not spinning pitch,fakhar zaman don't seem interested in test Cricket pushed in Sami Aslam would have been a better choice just continuing blunders by matriarch eg. Inzammul Haq and don't now who . 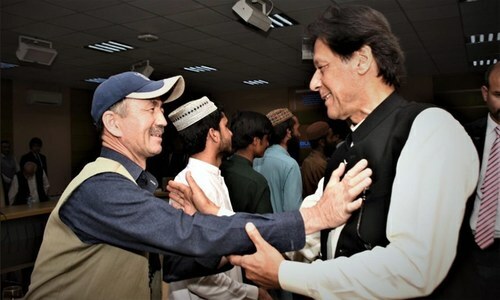 What else can the hand-picked, unelected and inept PCB administration say to remain afloat, deflect and divert attention from real issues faced by the green-shirts, consolidate and reinforce their feet, get counted, prove their authority and remain in the media limelight? He was Right to get angry. Those senior non performing batsmen should be thrown out of the team and asked to prove themselves again in domestic and then come back if deserve. Year after year and match after match we can't get our upper batting order to click. The main reason behind this is that the seniors have failed to take responsibiliy to move themselves up the order and take off the pressure from youngsters. There is not a single batsmen we have that has a solid technique... all gets exposed pretty fast. 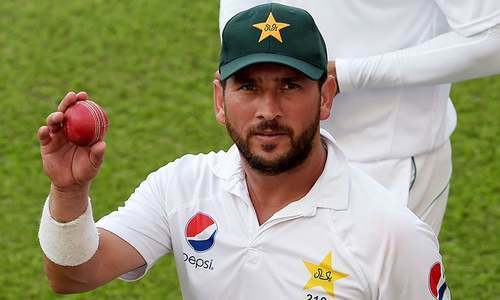 I would say ..we need to say good bye to sarfaraz and the other senior players from test cricket..it's not in their league to lead from the front..just a liability.. Also Inzimam needs to go as well he never groomed a single batsmen under him the legacy of producing decent batsmen came to a stop under his captaincy. @Aftab Qureishi, I agree with most of your observations, accept the last one. Fawad Alam, you don't know why Fawad is being kept out of game. There is a big reason. What else can he do after working hard with the team just to see two batting collapses in one game. Well, if he did it then he was perfectly within his rights. If the team is failing then it is the job of the coach to step in and sometime the coach has to yell, be sarcastic, show displeasure etc in order to rattle the players and get them out of their comfort zone to get the best out of the players. It is called the mind games and whoever knows it the best usually get the best from its players. All I can say is good luck. I hope the team learned from the experiences and toughened up to bounce back in the next test. The problem with Pak players is that they easily get intimidated due to inferiority complex, if they can overcome their complex and believe in themselves that they are the as good as anybody if not better then sky is the limit for them because Pak has the talent to beat any team in the world and it will only happen if the players believe in it too, the question is can the coach instill this idea in the team? Sarfraz batting is pathetic. Two ducks by a captain. He needs to be sent to domestic level to prove himself. @Pak_UK, umer akmal... Are you sure? Only yelled on them. Should have yelled on selection committee as well. So many much better players available but the playing batsman a disappointment. @Aftab Qureishi, I was with you until you mentioned Fawad Alam's name. What would it take to get through your skulls folks that Fawad does not have the game to succeed at the international level?!!!!!! If you don't believe me, just look at his last 3 innings that he played for Pakistan in BD where he scored 0, 1, and 2 in the 3 games he played. And that is just not it either, he DOES not have the game to play at the highest level. Back in the 70's, there was a player by the name of Shafiq Ahmed who would score tons of runs at the domestic level but could not score at the international level. So, some have it and some don't. Fawad does not have the game to be successful at the international level so PLEASE stop bringing up his name! @Nawaewatan, What may be the big reason? Misbah was recruited after he hadn't been selected for a long time, and he was already quite old, older than Fawad Alam I believe and he had the same amount of runs. I think Alam could be good as captain and also for solidifying the middle order. further during his stay they could groom Babar for role of captain, I think he should become captain after solidifying his batting a bit more. Time to bring Hammad Azam back at No 7 and make Shan Masood and Haris Sohail permanent part of our teams and drop Asad Shafiq and Imam. Fakhar should be told to just attack with Azhar Ali opening with him. Sarfraz cannot play anything above No9 in batting lineup. Unfortunately, Pakistan cricket set up is so weak that Sarfraz has to continue as captain - we cannot afford a captaincy change before 2019 WC. @Yankee Cricket Fan, I would love to hear why you think he can't play at the international level. Just because he didn't score in his last three innings doesn't mean he can't play. Please provide some technical reasoning behind your claim! Whatever coach did is right. Professional players cannot be spoon fed, they are paid to do the job not to bring shame. Whatever happens in the dressing room should stay internal. Mickey is the coach and has every right to tell the players off after this pathetic performance. He is the coach and fully accountable for Pakistan's performance. Having said that I think the selection process is biased and needs to be resolved immediately. Players are not selected on merit and this is preventing talented players from being selected and thus causing future development of Pakistan cricket. I would want Ahsan Manni to get involved in this issue in the long run. @Dr. Salaria, Aamir Ahmad, Wrong.PCB is very tough fighting a wrong case with BCCI and now busy arranging 3 million USD. They deserved to be yelled at ..... he is their coach and he has every right to yell at them because their performance warranted being yelled at. @Pak_UK, Imam and Shan were the only ones performed in second innings. Imam also had a good score in practice match. So I am in no big fan of his, but he is playing better than others at the moment. Pak players have mostly performed better when in fear of a dressing down from their capatain or coaches. However, although Sarfaraz is a good wicket keeper he should put his hands up and admit that test cricket is simply not for him. Please read article in Cricinfo "Havng seen happier dressing rooms than Pakistan's currently - Flower". That article in Cricinfo in a way contradicts what PCB is saying. Having said this what is even shocking is the fact that Flower is saying he is not involved in the selection process. Isn't he the batting coach? Shouldn't he be responsible for the batting collapse? I would like to know what Flower's responsibilities are as the batting coach? I would think these key coaches (MIkey, Flower, etc), chief selection team and captain have a cohesive relationship in the selection process. Of course, there are going to be differences of opinion but one should be able to stand by the players they selected.